High Quality Cooking and Serving Tongs With Silicone Tips. These might just be the best tongs you will ever use. They come equipped with a locking mechanism, durable stainless steel construction, and silicone coated tips to make cooking and serving easier. The coating on the ends will protect non-stick cookware from scratching or marking, and it will also make them more able to grip food without it slipping. This means that flipping and maneuvering will be hassle free because food won't drop due to and insecure grip. The coated tips will also reduce effort when it is time to clean up. Instead of old food and sauce sticking to the ends like glue, the high quality silicone on these tongs will ensure that food does not stick, and will wash off easily. The clever locking mechanism doubles as a hanging device, so you can easily store these on a hook or in the drawer when not in use. 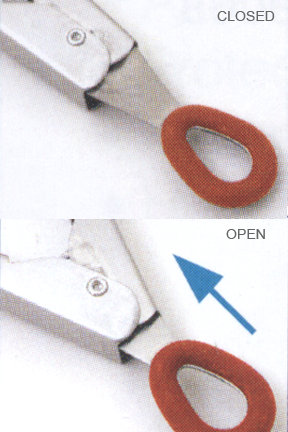 To operate the lock, simply pull out on the circle to secure them for storage in a drawer, or push down to open them for use. Intended to be used to grasp food in order to move it or flip it, these steel tongs are great for barbecues or cooking and serving food anytime. They can be used to flip a chicken breast in the saute pan, to rotate a red peppers under the broiler, to retrieve a lobster from the pot and much more. They are completely safe for non-stick cookware, and the silicone tips take really high temperatures in stride. The specially designed heads are thin and flexible so you will be able to easily glide beneath and around foods. These Swissmar Tongs are flexible enough for delicate foods such as fish, asparagus or scallops, yet strong enough for steaks and chicken. Heat resistant to 500F/260C, and dishwasher safe. 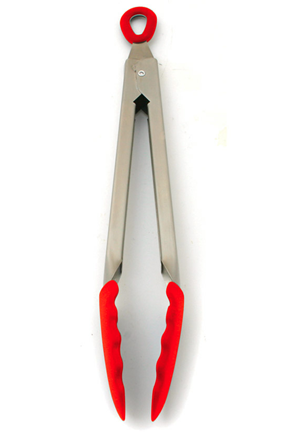 These tongs combine the strength of stainless steel with the all the advantages of silicone. They are far superior to traditional versions, and make cooking faster and easier. Available in two sizes in order to suit the needs of any user. The longer ones are ideal for using at the grill, while the shorter ones are perfect for use at the stove. Any chef or food enthusiast would love to have these as part of their tool kit. The silicone outer layer, which is heat resistant to 500 degrees F and safe for any type of cookware, is bonded to a flexible stainless steel core for stability and comfort. All of the materials are commercial quality, so you know they will work well, and last a long time. The silicone tips will not melt during use, but they will make handling food easier. Imagine no sticking, easy clean up and improved usability. These silicone coated tongs from Swissmar will work better than the ones you are using now, and will keep performing just as well for years to come. Order Yours Today! Swissmar Locking Silicone Tongs - High quality materials and craftsmanship make this Swiss made kitchen gadget a must have. A great accessory for anyone that enjoys cooking. Make cooking and serving a faster and easier experience with these great tongs.